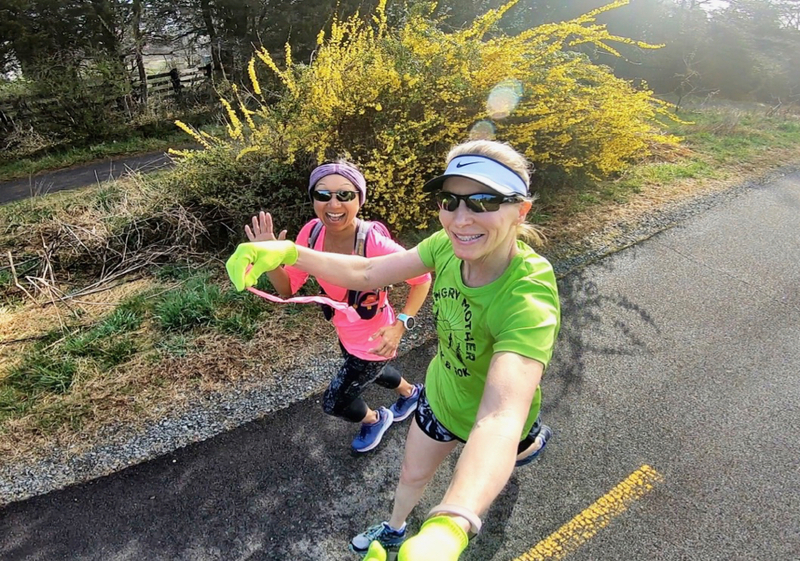 On Sunday evening I got a text from Deborah asking if I’d like to join her, Kim, Coco, Erica, Linda, and several of Deborah’s MRTT friends for dinner on Friday as they celebrated their upcoming race, the Cherry Blossom Ten Miler. Imagine about twenty women – who all love to talk about running – standing around in a kitchen (don’t we always do that?) excitedly discussing training plans, race day attire, favorite races, etc. The volume quickly grew to that of a teenybopper sleepover and it was fabulous! Thank you again, Deborah, for hosting us and including me even though I didn’t run in the race this morning. I feel like perhaps I should move on from my fitness blog and start writing a DIY blog. This past week I put together three pieces of furniture for our master closet (as part of our master bath remodel). 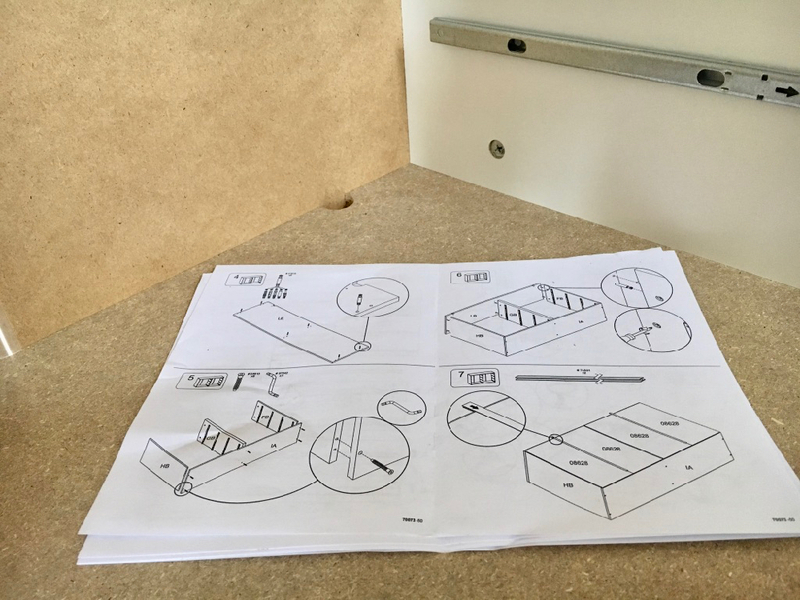 Think IKEA-style with wordless directions and you’ve got a good feel for my project. The first piece was slow going because I didn’t want to have to take anything apart after putting it together incorrectly. Once I figured out my system, I plowed through all sixteen drawers with ease, assembly line fashion. Anytime I wasn’t with a client, I was working on the furniture and managed to finish up our two chests and a dresser on Friday morning. I continued to feel progressively better this week until after Saturday’s run when I felt some nerve pain in my leg. The pain could be a result of a bit too much mileage on my runs this past week, or it could be from over stretching while teaching my Balance and Stretching Class on Friday. Just as I turned to the left during a seated torso twist stretch, I felt a pull in my right SI joint area. It’s feeling much better today so I’m hopeful it was just a little annoyance that’s already healing. My MRI is scheduled for this Wednesday and I’m hoping it will bring some answers to my numb right foot and shin. I’ve learned to hold my spine like an immobile stick while reaching into the sink to wash dishes and that helps tremendously, but it looks ridiculous and is very awkward and uncomfortable. My mileage total hit 15 for the week. My two weekday runs were at zero-dark-thirty (yes, I headed out one morning at 4:40 AM, the other at 5:05 AM). A girl’s gotta do what a girl’s gotta do to fit her runs into a busy day. Of course, the highlight of my running week was meeting Tracy at Trailside Park for a run on the W&OD Trail. We ran east the short distance to where the new bench Bill and I donated is located (near mile marker 28). Since I’d stopped by on Wednesday, the caution tape had been removed, but the bench was wet from the overnight rain and we couldn’t sit on it. I had planned to run the Hungry Mother 25K Trail Race on Saturday, but once I realized I wouldn’t recover in time from my injury to train properly, I didn’t register. So I did the next best thing and wore last year’s shirt – my favorite race shirt – on yesterday’s run. Bloggers, have you had the opportunity to do any meetups with online friends? 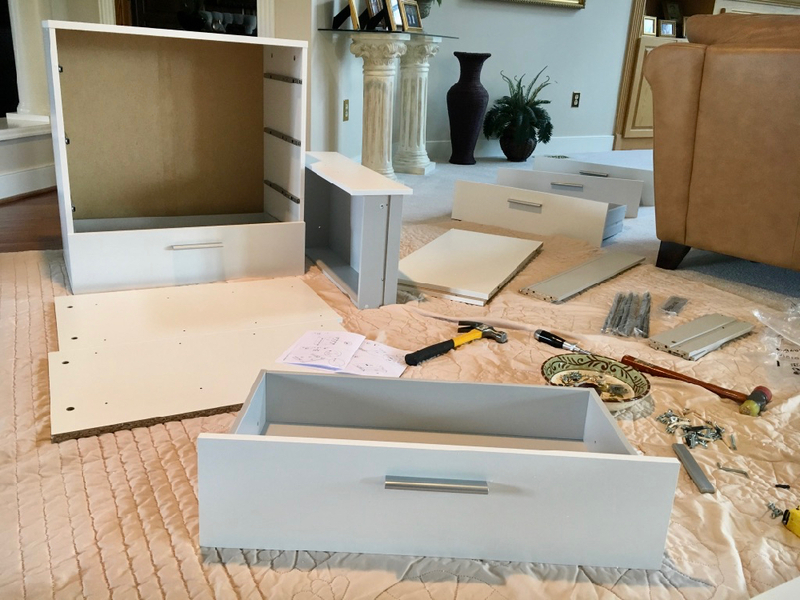 Have you tried putting together IKEA-style furniture? Thoughts? ~ I was fine once I got the hang of their pictures and figured out which screws were which. They all looked alike in the pictures. I have to answer YES to all of the questions LOL I’m a very visual person (ahem #artgeek), so I do better with actual diagrams/drawings than written words (most of the time). It was so nice to finally meet you (and several others) in person. As I said, it felt more like a reunion than a first time meet-up 🙂 Thanks so much for linking with us!! I love meeting up with online friends! Isn’t it great how we can just feel so comfortable with each other? It’s just great. Glad that you’re getting some miles in but I’m curious to hear what you find out from the MRI! I’ll definitely keep you updated on the MRI results. In the time it takes me to read instructions, Mr. Judy can have something assembled. I’ve assembled stuff here & there, but I leave it for the master. Rather than a fly on the wall, we would have wanted you to be right there in the middle of the conversation! Aw so fun to get all the blogger ladies together. Luckily I’ve never had to put together IKEA furniture (I’ve always gotten help or bought the already made furniture off a friend). Looks like wordless instructions would be challenging though! It really was a fun evening getting to know these ladies better. Everyone was just as sweet in person as they appear on their blog! Love your bench and the good timing for a picture! Oh yes, I’ve put together several of those kinds of furnitures. Fun, fun, fun!! Hmm..I thought I had already commented, but it didn’t show up! I love the bench that you donated, it looks great! I’m glad running is feeling better this week. So fun that you got to meet up with so many other run bloggers! Thanks, we were very happy with the way the bench turned out! We’ll have to plan a ride together out this way sometime this summer. I just love how blogging can bring people together! Your get together sounds like it was a blast. Yes, it was a fun blogger gathering! 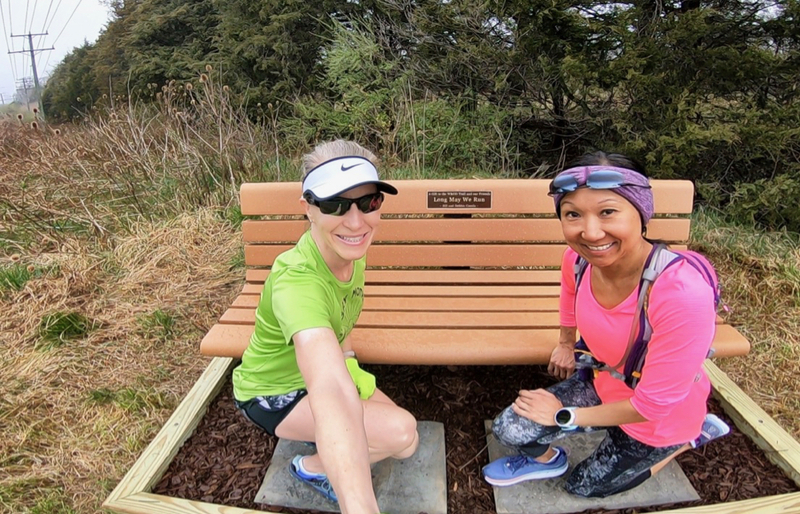 The bench you and Bill donated for the W & OD trail is so cool! You guys should be proud of yourselves! The gals night on Friday sounds like a lot of fun. I am now wishing I had signed up for the Cherry Blossom. I love that race! It would have been so fun if you had been in town to run the race and had been able to join us! I love the bench, Deb! What a nice gift you two have given!! Good week, and I understand why you didn’t register for the trail race. Bummer though!! hopefully next year! I LOVE that you got to meet up with these amazing ladies! Not envious at all!! I met quite a lot of bloggers in the past, when Fitbloggin was a thing. So many amazing people. I saw a Fitbloggin friend in Paris, the first time I did the marathon. I met Marcia at RnR Dubln. I met Kim G at Chicago marathon 5K. As I live on another continent it’s hard, but hopefully in Chicago this year there will be another chance. We have a lot of Ikea furniture at home… I have put together exactly one item! To be fair my husband is one of those “step aside while I look hot in this tool belt and proceed to flex my muscles putting this together”, so I make sandwiches and coffee and let him do his thing 🙂 His dad was a painter and a carpenter and taught him a lot when he was young. He’s also actually just built me shelves and cupboards just from me asking and describing what I would like to have. No racing for me, but I supported my running group on Sunday in a 5K race. 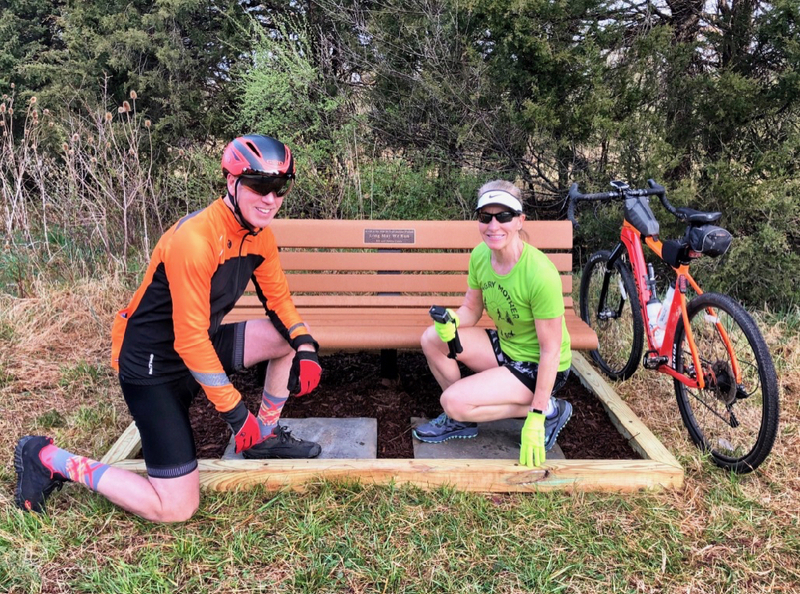 Thanks, we were happy to be able to donate the bench and give back for so many years of using the trail for both running and biking. All of the ladies are just as nice in person as they appear on their blogs! You would have loved them, too! Love the bench! How fantastic and what a great contribution from you both. And you are a much braver woman than I am for putting together that furniture from IKEA! Omg – no way!! And I really love that you were part of the pre-race party without the race 🙂 Sounds like a great time! The bench is pretty cool and we’re really happy that we were able to donate it. We’ve been running and biking on the 44.5-mile long W&OD Trail for many years and it was the least we could do to pay it back to the community. The pre-race party was so much fun! It was so fun meeting you and all the others! I’m so bad about following instructions. I likely would have winged it on the closet furniture with a few curse words along the way. I travel in to DC for business once or twice a year and have run the W&OD Trail while there. I will have to check out the bench! It was so nice meeting you as well, Linda!